THE B-MOVIE NEWS VAULT: Scream Factory's PAUL NASCHY COLLECTION comes to Blu-ray on June 20th! Scream Factory's PAUL NASCHY COLLECTION comes to Blu-ray on June 20th! SCREAM FACTORY BRINGS FIVE CLASSIC PAUL NASCHY FILMS TO BLU-RAY IN ONE AWESOME COLLECTION ON JUNE 20TH! I've only dipped a toe into the cinematic realm of Paul Naschy, but this set seems like it'd be a great way to fully immerse myself in the work of one of Spain's most prolific genre filmmakers. Featuring five of Naschy's classic films completely uncut, this is definitely yet another must-own title from our pals at Scream Factory! There's a lot of ground to cover here, so let's get to it! Synopsis: Naschy plays an Indian mystic named Kantaka, who creates a small army of zombified women to do his deadly bidding! The film's original title is translated as REBELLION OF THE DEAD WOMEN, so I'm guessing things turn sour for Paul Naschy (who also has two other roles in the film!) towards the end of this movie. Synopsis: Alaric de Marnac (Naschy) is a warlock in medieval France that ends up getting be-headed for practicing the dark arts. (His mistress doesn't fare too well either as she is tortured and killed.) Centuries later, Alaric's head is discovered hidden within a monastery. His head comes to life, and Alaric begins possessing people as he searches for his missing body, and attempts to resurrect his lost love through human sacrifice! NEW! Audio Commentary by Rod Barnett and Troy Guinn of the podcast, NaschyCast. Synopsis: A drifter named Giles (Naschy) is hired as a handyman at a house in a small French village. At around the same time, a killer is on the loose in the region, that is murdering blue-eyed women and gouging out their eyes as trophies. Is it Giles, or is someone else responsible for the gruesome killing spree?! Synopsis: Waldemar Daninsky (Naschy, who also wrote and directed this film) is executed alongside Elizabeth Bathory. Centuries later, Daninsky is coincidentally revived, and does battle with the revived Elizabeth Bathory, in this somewhat remake of Naschy's LA NOCHE DE WALPURGIS (aka WALPURGIS NIGHT). Synopsis: Also known as THE BEASTS' CARNIVAL, this film was stars Paul Naschy as a hitman that double crosses The Yakuza. Wounded and hunted in the mountains of Spain, he eventually finds shelter with a doctor and his daughters, who have some diabolical plans for their guest! THE PAUL NASCHY COLLECTION has a street date of June 20th, 2017, and is available to order at AMAZON, BULLMOOSE, and DIABOLIK DVD. However, if you order directly from SHOUT! 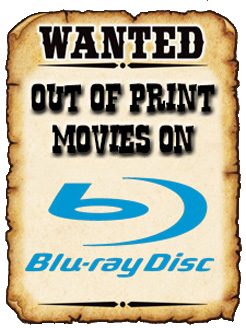 FACTORY, they will ship your Blu-ray set out ASAP so you'll have it before everyone else! Regardless of where you buy it, be sure to pick up this collection because there's no telling if it'll go out of print as fast as the first VINCENT PRICE COLLECTION Blu-ray set did!